Photo courtesy of CU Cedarville University’s Emily Chapman (0) drives to the basket, Nov. 20 in a home win over Ohio Christian University. CEDARVILLE — Cedarville University’s women’s basketball team buried 15 three-pointers and held the lead from the opening tap during an 87-64 non-conference win over Ohio Christian, Nov. 20 at the Callan Athletic Center. The Yellow Jackets (3-1) take a three-game winning streak into the Thanksgiving holiday. Six different players knocked down shots from deep. Freshman Emily Chapman came off the bench to drill four en route to scoring a career-high 18 points in her fourth collegiate outing. Abby Wolford netted 13 points, Regina Hochstetler tallied 11 and Baylee Bennett finished with 10. All three players flipped in three 3-pointers apiece. Leading 45-32 at halftime, Cedarville scored the first 11 points of the third quarter to spark a 17-1 run. Chapman needed just 19 minutes to score her 18 points. Ten different Jackets were credited with assists. All 13 players in uniform played and 12 scored. The school record for most treys in one game is 16 accomplished twice – in games with Malone College andAlderson Broaddus University. CU has made at least 12 threes in three of the four games thus far. The women’s team has won all six meetings versus Ohio Christian. The Jackets’ next five contests are all Great Midwest Athletic Conference games, beginning Thursday, Nov. 29 with a home game against defending tournament champion Hillsdale (Mich.) College. 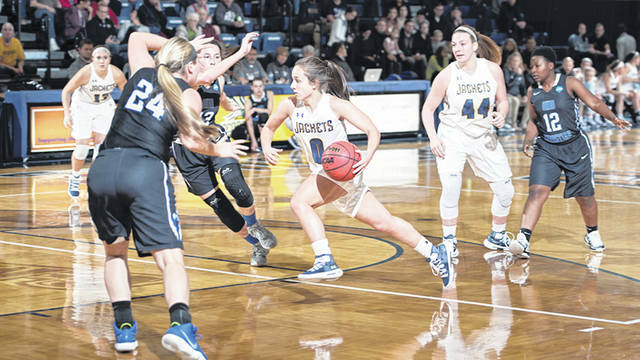 https://www.xeniagazette.com/wp-content/uploads/sites/32/2018/11/web1_CUWomen.jpgPhoto courtesy of CU Cedarville University’s Emily Chapman (0) drives to the basket, Nov. 20 in a home win over Ohio Christian University.